After I was baptized in the Holy Spirit, God's word has been my most treasured possession. But not only as an exciting book, but as a guideline for both life and teachings. And how to live the new life. Believe that there are many, many thousands, yes, sure also millions who have followed the word of God and the light that God has given them in their own words. 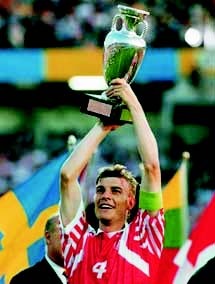 Picture shows the Danish Championship triumph of 1992 the trophy is raised (for a Danish so this is the greatest triumph as some Danes have performed on the sports). For us believers, we first - not before - could raise our "cup" the day we are at home in the New Jerusalem, until then our life down here a struggle. It is only when we full can say that we have been left after having done everything. Then we need a stadigvek to be led by the Lord and his Spirit. Job said, Job 7:1 Is not man's life on earth is war, and his days as is hired days? Here are a few pages or points on how to get the experience and "get" a walk in the Spirit. Or as I write the headline: "How wander a life in the Spirit and be standing after having done all!?». 1) Spirit's testimony or to hear the voice of God in one's inner self. Acts 10th 19 While Peter was now pondering the vision, the Spirit said unto him, Behold, three men are looking after thee; 20 Arise, and go down, and go with them, doubting nothing for I have sent them. We read here that Peter had a vision, but it was not enough to convince him that he should go to the Gentiles to preach to them and sharing table fellowship with them. But then God spoke to him through the witness of the Spirit, that convinced him. Getting into God's leadership, the ability to be and was witness of the Spirit which God speaks through our conscience. We know what is right and prudent, let us be guided by conscience and is not against God but say yes to what our internal speaker even if it goes against our own and others' ways of thinking and belief. What's brief to hear the Spirit's voice? This can say so much about, but it is short, listening to one's own conscience, be was for it, and obey the voice that comes from one's own conscience. Conscience, idiosyncratic sense of comfort or discomfort, whereby a person experiences their own actions as morally right or wrong (good or bad conscience). There are various theories about what conscience is. Christian thinking is raining like that conscience is put into us by God. Another view holds conscience to be innate without being inspired by God. A common view today is that conscience is a product of social learning and education. Best known is perhaps Freud's theory of conscience as an over-I or super-ego, one internalized and not fully aware of the takeover of the authorities (parents or society) norms and values. In ethics, it is common to say that acts in accordance with his conscience, is subjectively right. They do not therefore to be objectively true or in accordance with generally accepted moral or religious norms and judgments. Kant regarded conscience as a fornuftsvesens awareness of the moral law, the categorical imperative. (End of quote). All people have a God-given conscience. But we as believers in Jesus has cleansed conscience through the blood of Jesus and that stadigvek is adjusted by the word of God as long as we live as true believers. 2) Responsive and receptive to hearing from the Lord and receive signals from him. Isaiah 50:4 The Lord GOD hath given me the tongue, so I should be able to cattle the weary with a word he awakens my ear every morning, he awakens me to hear that disciples hear. My experience is an Norwegian Christians are closest to the ears become clogged, spiritual deafblind. I know there are very strong words, but unfortunately it is true. Yet if this is true, then it is equally true that God can give anyone and everyone who is open to him an ear to the prophet Isaiah speaks of, "he awakens my ear every morning, he awakens me to hear that disciples hear. " What is he really saying? You will become his pupil and God your teacher, so simple and clear. This is really a location and position as believers we should not just be here on earth, but for eternity. Therefore, this is also so precious. What the Lord speaks to us today? Something God spoke to me exactly twenty years ago that the biggest and most dangerous apostasy within its Christianity is when it is accepted by distinguished preachers. What did I do? All that was in my power to warn against this, although I should have done it much deeper and better. I did mine, and today we see this as really began before this has become widely accepted within its most churches and denominations. 3) Be in the right place and in the work and mission God has placed you. Did the Romans are so wonderful and nice, especially chapter 12 Where tales that we are a body, but have different tasks and services. When one enters the work, mission and ministry that God has for one, then put things a lot more to the right. Hence also the Spirit's leadership to find their "right" place. I can eg. know when I teach God's word that it is a work of God. How? In several ways. That I know the anointing of God, God's Word opens and many are set free, etc. so I could go on, but will stop here. This has become a small series of articles. When three articles in which this is the latest as this subject is so vast and comprehensive. I hope and believe that this teaching gives you something so that your life will please God in all aspects! This is the last article about walking a life in the Spirit and remain standing after having done everything. It is possible, with God's help! Both believe and hope that if you study this I have taught here, take it to heart and live by it, you and I and all who are God's way experience being led by the Spirit and standing after having conquered and defeated all! While we are down here on earth, we can say that Job that our life is a war. Job 7:1 Is not man's life on earth is war, and his days as is hired days? Nr. 520: If we let us be deceived?